Western blot analysis of extracts from CHO cells, transfected with non-targeted (-) or SignalSilence® Akt siRNA I (+) siRNA, using Akt Antibody #9272 and p42 MAP Kinase (Erk2) Antibody #9108. 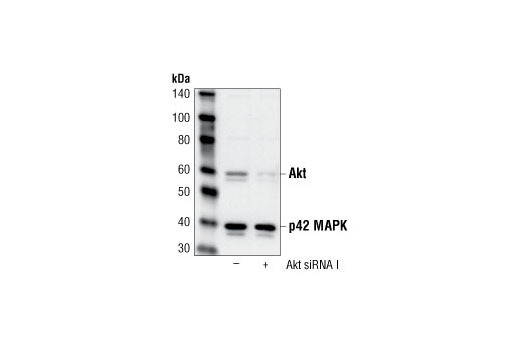 The Akt antibody confirms silencing of protein expression while the p42 MAP Kinase (Erk2) antibody was used to control for loading and specificity of Akt siRNA (A). Phospho-GSK-3β (Ser9) Antibody #9336 was used to confirm downstream pathway inhibition (B). Western blot analysis of extracts from HeLa cells, transfected with 100 nM SignalSilence® Control siRNA (Fluorescein Conjugate) #6201 (-) or SignalSilence® Akt siRNA I (+), using Akt Antibody #9272 and p42 MAP Kinase (Erk2) Antibody #9108. 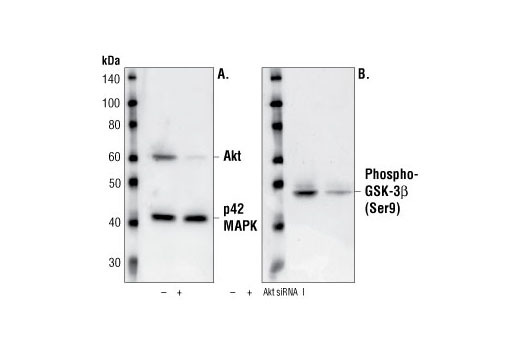 Akt antibody confirms silencing of Akt expression, while the p42 MAP kinase (Erk2) antibody is used to control for loading and specificity of Akt siRNA. CST recommends transfection with 100 nM Akt siRNA I 48 to 72 hours prior to cell lysis. For transfection procedure, follow protocol provided by the transfection reagent manufacturer. Please fell free to contact CST with any questions on use. SignalSilence® Akt siRNA I from Cell Signaling Technology (CST) allows the researcher to specifically inhibit Akt expression using RNA interference, a method whereby gene expression can be selectively silenced through the delivery of double stranded RNA molecules into the cell. All SignalSilence® siRNA products from CST are rigorously tested in-house and have been shown to reduce target protein expression by western analysis. Small interfering RNA (siRNA) has been used to specifically silence Akt in CHO cells and 3T3-L1 adipocytes (20).